Explore the mountains and coast of Montenegro with a reliable partner. 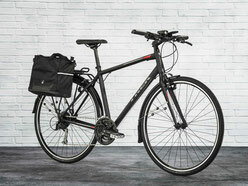 The 27-gear Trek will take you everywhere on asfalt. FX 3 is a workhorse hybrid bike that offers the speed of a road bike, the versatility of a city bike, and the comfort of a fitness bike. A lightweight Alpha Gold Aluminum frame, a carbon fork, and a performance drivetrain make it a speedy and versatile. Helmets, repair kits, air pumps, first aid kit, child seats and helmets up to 22kg -- these items can be borrowed free of charge for the duration of the rental period. Special offers for groups of 4 and over. Do you want to concentrate only on the enjoyment of riding? We offer guided or self-guided tours. Please contact us for an offer that fits your style.